Link to original TalkStats thread, September 17, 2013. Today a labmate asked the following question: if we have three random variables x, y, z, and we know the correlations and , what constraints if any does this place on the correlation ? At the time I reflexively answered that the remaining correlation must be the product of the two known correlations. Which of course is totally wrong. I think I was getting some mental interference from some of the equations for simple mediation floating around in my head. Anyway, after thinking about it for a while I have come up with a convincing geometric argument for what the constraints actually are. I have also verified that my answer agrees with a more complicated-looking answer to this question that I found elsewhere online. Because I ending up spending a lot of time on this and I thought some of you would find the results interesting, I thought I would share my work here. Comments are welcome! Okay. 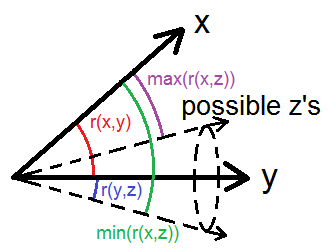 So imagine our variables x, y, z as vectors in n-dimensional space. The Pearson correlation coefficient between any two of these variables can be interpreted as the cosine of the angle between the corresponding vectors. This is an interesting and well-known geometric fact about correlation coefficients. One notable result following from this is that if x is orthogonal to y and y is orthogonal to z, then there is no constraint on , it can be anywhere from -1 to +1. But under any other circumstances, fixing and will place some constraint on the range of . Okay, now for the verification part, which requires a bit of math. which is the answer we got from the stackexchange post. So our simpler, geometrically based answer agrees with the more conventional answer that is harder to understand. Link to original TalkStats thread, June 24, 2012. Following the discussion in this recent thread and spunky’s request therein, here is a neat trick one can use to test arbitrary contrasts for ANOVA models, and even multiple degree of freedom tests, using only some basic summary statistics of the kind that would be reported in a manuscript — without needing access to the raw data. where and are the numbers of parameters in the full model and the nested model, respectively; and is the total sample size. So the only two missing quantities here are SSR and SSE. If we can get those we can compute the desired F-ratio. where is the contrast weight for group , is the mean for group , is the number of groups, and is the number of observations in group . Now we need to get SSE. To do this, we can use the same formula to compute SSR for a contrast for which we already know F, and then rearrange the F-ratio formula to solve for SSE. Aside from some minimal rounding error, we have it. Given the same data as above, suppose now that for some reason we wish to see the 2 degree of freedom test comparing the full ANOVA model (factors A, B, and their interaction) to a model that only includes factor A.
where is the predicted value for observation under the smaller or reduced model, is the predicted value for observation under the larger or full model, and is the number of observations. Essentially, we are treating the predicted values from the more complex model as the data to be predicted and then computing the sum of squared errors in the normal fashion. where is the number of observations in group , is the predicted value for group under the smaller or reduced model, is the predicted value for group under the larger or full model, and is the number of groups. The predicted values from the Large model are straightforward: they are the group means. For the Small model, we have two sets of predicted values, those for and , and in both cases these predicted values are weighted averages of the two cell means at each level (i.e., collapsing across the factor), weighted by cell size. And again we have it, save for minimal rounding error. Austin data scientist in the retail industry. Teetotal vegan rock climbing cyclist. Sorry for the confusion. I actually want population-averaged effects.